Bidspirit auction | Antisemitic Print - Social Positions. 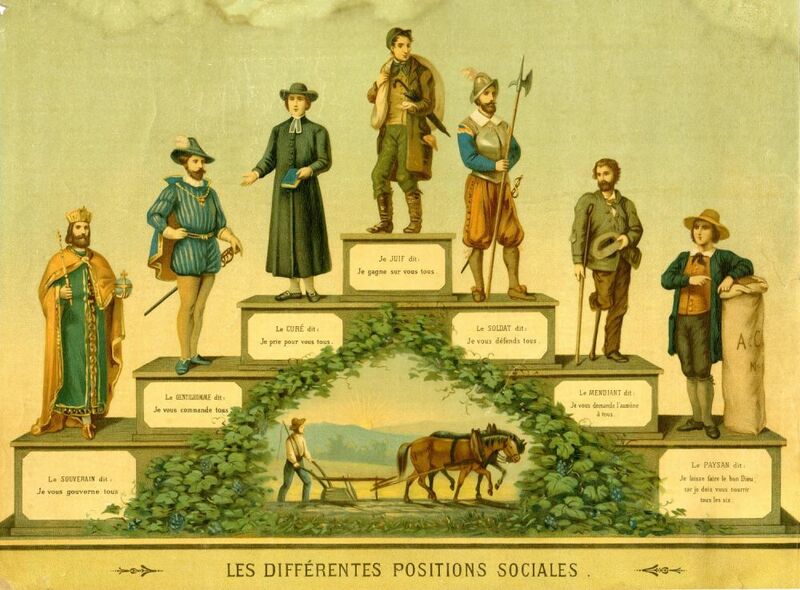 Les Différentes Positions Sociales [The Different Social Positions]. Color lithograph print. Without neither publisher's nor printer's names. [France? Late 19th Century]. French. Antisemitic print showing stairs with seven figures on them - a governor, a nobleman, a priest, a Jew, a soldier, a beggar and a farmer. Under each figure, there is a naive saying attributed to it. The Jew, dressed in the outfit of "The Wandering Jew" [the stereotypical character of a Jewish figure in France of the 19th century] with a wanderer's satchel on his shoulder, standing in the middle on the uppermost stair with the saying, "I beat all of you." There was a similar print appearing in Frankfurt at the same time in which the saying attributed to the Jew was, "I must live from the profits." Size: 41x32 cm. Stains, fine condition.